Sun., May 13, 2018, 12:06 p.m.
BOISE – Idaho voters will narrow the candidates in each primary race Tuesday after being subjected to lengthy and expensive campaigning efforts that have taken a negative turn. With Idaho’s strong red roots, the GOP primary is often considered the most competitive leg of the election season because Republican candidates rarely face a strong Democratic challenge in November. As a result, millions of dollars has been spent on advertising, flooding the airwaves, social media and mailboxes with candidates throwing jabs in hopes of getting the upper hand. TV advertisements have accused gubernatorial candidates of being snakes, others have used shadows shaped like Pinocchio noses to highlight their candidates’ so-called lies, while some mailers have sparked outrage by implying that candidates were really foreign agents and attempting to buy power in Idaho. The most competitive and crowded races are for the open seats for governor and the 1st Congressional District, but Idaho’s lieutenant governor and state treasurer seats are also up for grabs without an incumbent. State Superintendent of Public Instruction Sherri Ybarra is hoping to secure a second term against GOP opponent Jeff Dillon. Meanwhile, Attorney General Lawrence Wasden, Secretary of State Lawerence Denney and State Controller Brandon Woolf aren’t facing primary challengers. The top candidates running for governor are Lt. Gov. Brad Little, U.S. Rep. Raul Labrador and Boise businessman Tommy Ahlquist. Three-term Gov. Butch Otter announced he would step down after serving nearly four decades in public office. 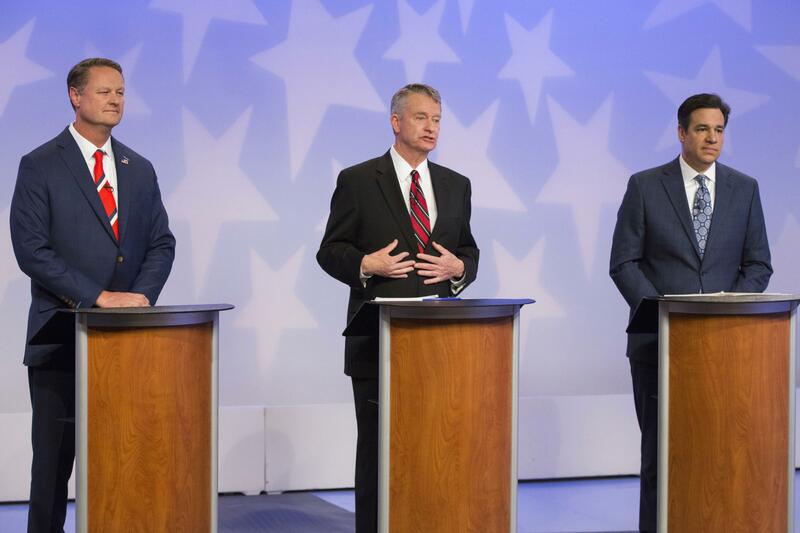 All three gubernatorial hopefuls have claimed to be the most conservative candidate, promising to cut taxes and address the state’s health care system to make it more affordable and efficient. Labrador, a founding member of the House Freedom Caucus with strong support from the Statehouse’s most far right members, is hoping his name recognition and efforts in Congress lead to a heavy turnout from his supporters. Little has the endorsement of not only Otter but also every living former GOP governor in Idaho. Little maintains that the state is on the right path to continue growing and attracting businesses but his leadership is needed to navigate the growth. Ahlquist, an emergency room doctor turned developer, has campaigned on being the “political outsider,” arguing that he has the vision needed to shake up the status quo. He has no political experience. For Democrats, former state Rep. Paulette Jordan is vying to become Idaho’s first female nominee of a major political party. In her bid for governor, Jordan faces Boise businessman and longtime school board member A.J. Balukoff. Balukoff is making his second attempt to be the party nominee after failing to beat Otter in 2014. With Labrador stepping down to run for governor, seven Republicans have flocked to take over his congressional seat, including former state Sen. Russ Fulcher, former Attorney General and former Lt. Gov. David Leroy, first-time candidate Michael Snyder and state Reps. Luke Malek and Christy Perry. Meanwhile, five Republicans are vying to become the state’s next lieutenant governor: Idaho Falls businesswoman Janice McGeachin, former Idaho Republican Party Chairman Steve Yates, state Rep. Kelley Packer, and state Sens. Bob Nonini and Marv Hagedorn. Idaho’s lieutenant governor presides over the state Senate and steps in when the governor is out of the state. It’s a part-time position, and any major impact largely depends on the relationship between the governor and the lieutenant governor. Two Democrats are also running for the lieutenant governor seat, but only Kristin Collum has the endorsement of Jordan. The two women have teamed up to call themselves “Idaho’s first all-female joint ticket” – although joint tickets don’t exist in Idaho – as a sign of solidarity in pushing a progressive platform. It’s unclear if either candidate will step down if the other loses on Tuesday. Idahoans can register to vote the day of elections. However, four years ago, the Idaho Republican Party closed the state’s GOP primary so that only registered members could participate. Despite fears, the move has not resulted in a steep drop in voter turnout. Instead, voter turnout in Idaho has hovered around 25 percent among registered voters in recent primary election cycles. Published: May 13, 2018, 12:06 p.m.